26.2 Quest: KT Tape - Have You Used It? Some time ago I was sent some KT Tape to try out and see what I thought. I have not had the types of injuries to use these and give them an adequate test so I tried them on my daughter's foot following their instructions to try and alleviate her arch pain. Payton actually had more pain when she ran with the KT Tape, but I am not blaming the tape, but rather that we were providing more support with the tape, and that is not what she needed. It turned out that her arch pain was much more than what could be helped with just tape, and we ended up having to go with some Custom Orthotics before we actually made any progress with her issues. I still have two trial packs left and I am hoping that someone else can benefit from them. Maybe someone can try them with success on a current injury, and find a new product that they can use in the future. 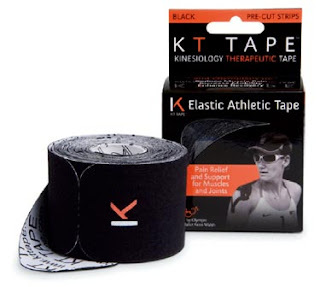 Have you tried KT Tape? If so, what has your experience been like? If you would like to give these a try, please let me know in your comment. You can leave a comment here on this post, or on this post on the 26.2 Quest Fanpage. I am going to wait a few days and pick someone to send these to (no longer than a week). Since this is not really a giveaway like all the others I do I am not setting an end date, nor am I promising to chose randomly. I will most likely chose randomly, but if a specific comment jumps out at me I want to give myself permission to over-ride the random selection - I hope you understand. I will not be posting an additional post to announce who was selected, that will be done in the comments of this post. I've never even heard of it before! I have had KT Tape recommended to me many times but have not had the opportunity to try it yet. 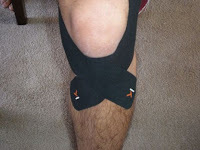 I suffer from IT Band issues in my right leg and have always wondered if KT Tape would help. It's one of those things that I keep meaning to try but never get around to picking up after a race or run. I was looking to try them at the Princess Half Marathon back in Feb but they weren't a vendor for that event (weird huh?). I don't know if KT Tape will help my IT Band issues but it couldn't hurt to give it a shot. I used some and had my husband apply for a shoulder issue. It was helpful. He applied it as instructed and it held everything in place. We tried it on my knee, but we just didn't get it right. Found out my chiropractor is certified to apply kinesiology tape. He taped me each week for about 3 weeks for my weekend long runs and soccer games. It helped a ton. I was having terrible swelling and pain after activity, but with the taping I was able to continue my training and playing pain free and once my legs strengthened up a bit, was able to run support free. If I start having any issues, my plan it to see the chiro and pay $10 to get taped up. Worth it to me if I'm training for something big. I really like KT Tape. It helped me a ton in my final weeks of marathon training last fall. That being said, tape shouldn't treat injuries and it didn't help me get through the marathon since my injury was beyond repair at the time. I highly recommend it for someone at the end of a training cycle. That being said, I don't need any as I bought 3 packs of it last fall and still have 2 packs left. I've heard of this tape and seen athletes wearing it but not tried it myself. I sure would like to try a sample for my husband (fortunately I don't have any injuries myself right now, but of course that could change anytime!). He's a tennis player not a runner as such, though he does run a little to keep in shape for his tennis game, but he has a bad knee, bad shoulder, bad elbow, actually looking at this list I'm wondering if he has any joints that DON'T hurt, so I wouldn't mind trying this out on him to see if it helps. Thanks everyone for leaving comments. The winner was selected and Shawn Hill was the one that was selected.